Good health good wealth all year round. 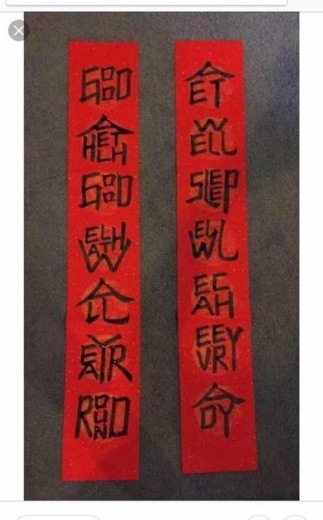 Around this time of year, Chinese traditionally liked to post "spring couplets" (chūnlián 春聯 / 春联) — a special type of "antithetical couplet" (duìlián 對聯 / 对联) — on the door posts of their homes or elsewhere as auspicious decorations. Here someone has fashioned a spring couplet from square word English calligraphy. Spring couplets are typically heptasyllabic, and this one is heptagraphic. In other respects, though, it is atypical, since it doesn't have a quadrisyllabic capping phrase for the lintel and is not really antithetical in its structure. Moreover, it doesn't follow the usages of either of the two established versions of square word calligraphy (see "Readings" below). The sentiment, however, is certainly suitable for best wishes at the advent of the Lunar New Year. Happy Year of the Pig, everybody! I'm glad it doesn't say "ache every day", as I first thought. Looks a little like Hangul. The image that Victor posted was good, but having following the links I think that the work by David Kelley (sample) is truly staggering. Could you use Square Word Calligraphy to write pinyin? Why not? Strokes (including "dots") similar in shape to the tone marks are available. its almost exactly how korean letters work.